I take my Raindrop Animation from last time and converted it into a screen saver, complete with a Settings dialog, to allow tweaking the various parameters. Last time, I created a WPF application that displayed an animated simulation of raindrops falling on water. It was a little work, but not a huge effort, to convert that application into a Windows screen saver. A screen saver is mainly just a regular .exe file with a .scr extension that has been copied into your C:\Windows\system32 directory. In the simplest implementation, your application will just run when the screen saver kicks in. 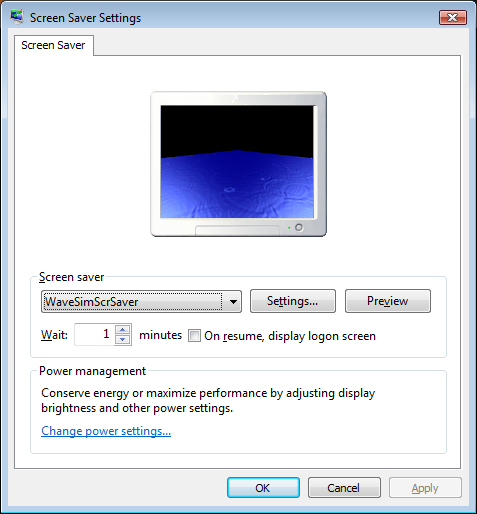 But a fully functional screen saver in Windows will also support two additional features—running in the little preview window in the Screen Saver dialog and providing a customization GUI that is launched from the Settings button in the Screen Saver dialog. You’ll also want to tweak the normal runtime behavior so that your application runs maximized, without window borders, and responds to mouse and/or keyboard events to shut down gracefully. The first thing that we need to do is to change the main Application object in our WPF application and tell it not to start up a window, but to execute some code. We remove the StartupUri property (was set to “Window1.xaml”) and replace it with a Startup property that points to an Application_Startup method. // Used to host WPF content in preview mode, attach HwndSource to parent Win32 window. // immediately (because we don't have a GUI). /// we opened Screen Saver dialog or switched dropdown to this saver. The most complicated thing about this code is what we do in preview mode. We need to basically take our WPF window and host it inside an existing Win32 window—the little preview window on the Screen Saver dialog. To start with, all we have is the handle of this window. The trick is to create a new HwndSource object, specifying the desired size and who we want for a parent window. Then we attach our WPF window by changing the HwndSource.RootVisual property. We also hook up an event handler so that we know when the window gets disposed. When the parent window goes away, we need to make sure to shut our application down (or it will continue to run). Running in normal screen saver mode is the most straightforward of the three options. We simply instantiate our Window1 window and show it. For settings/configuration mode, we show a new SettingsWindow window that we’ve created. This window will display some sliders to let the user change various settings and it will also persist the new settings to an .xml file. The Raindrop settings are encapsulated in the new RaindropSettings class. This class just contains public (serializable) properties for the various things we want to tweak, and it includes Save and Load methods that serialize the properties to an .xml file and read them back in. It’s important that we serialize these properties in an .xml file because the screen saver architecture doesn’t expect to display a settings dialog while the screen saver is running. Instead, it expects to run the application once to allow the user to change settings and then run again to show the screen saver. /// for loading from file and persisting to file. /// Instantiate the class, loading settings from a specified file. /// If the file doesn't exist, use default values. /// exist, or if there is a problem, no settings are changed. Here is the .xaml for our SettingsWindow class. The window will contain four sliders, one for each setting. It also includes a button that resets everything back to the default values. When the user clicks the OK button, all settings are persisted to the RaindropSettings.xml file. (There is no cancel function). And here is the full code for SettingsWindow.xaml.cs. When we load the window, we read in settings from the .xml file and change the value of the sliders. When the user clicks OK, we just save out the current settings to RaindropSettings.xml. // Slider runs [0,30], so our amplitude runs [-30,0]. // water as each drop bloops in. The only remaining thing to be done is to change Window1 to get rid of our earlier sliders and to read in the settings from the .xml file. And here is the updated Window1.xaml.cs. Note that we also add event handlers to shut down the application when a mouse or keyboard button is pressed. // 25% chance for 3rd drop. Here’s a screen shot of the screen saver running in Preview mode. This is very satisfying, since getting this to work properly was the hardest part of the project. Great tutorial! Do you have any plans for completing the “Next Steps”? There is a spectacular screensaver for osx LotsaWater (http://wakaba.c3.cx/s/lotsablankers/lotsawater.html) and unfortinately no Windows version (ironicly it is based on a very old win32/opengl apllication).